I’ll probably try to work up a more widespread Cover Reveal when it’s finalized, but you get to see it first. 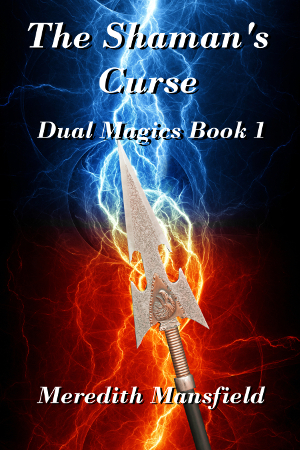 This is very nearly the final cover for THE SHAMAN’S CURSE. (Just fussing with fonts at this point.) What do you think? I just need to finalize the cover and finish about 50 more pages of the final edits. Then I can start formatting and be ready to prepare for a (hopefully) July launch. This time, I’d like to round up a few reviews before it actually goes live. I really do like the two colors! I have probably asked this before, but I may have lost the response. I do my own covers. Well, I have mu answer on my cover for my Novel. At the same time I redid the cover for one of two story sets I have at smashwords. Speaking of that I am almost finished with Smashwords file for my novel while I’m waiting on the cover. I had to redo one of those story sets so it would be formatted right for their premium catalog. If that works, the same thing should work for my Novel but I still wish I could test it before I get the cover. Good luck. Formatting’s not so bad once you get the hang of it.